I make these in tons of colors but photographed three of my best sellers: Montana Blue (AB), Light Peach, and Lavender. Please specify your color choice upon check out. Also available: (Not shown) Indian Sapphire (AB), (Jet (2x), Light Siam (Red), Crystal (AB), Capri Blue (AB), & Fuchsia (AB). 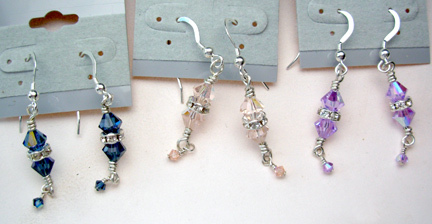 I stock many colors of Swarovski crystals for my classes. If you need something specific, just ask!